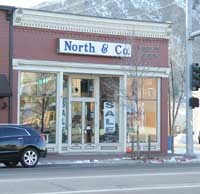 After 25 years of business, the North and Co. clothing store at 101 S. Main St. in Hailey is closing its doors for good. Meanwhile, several other businesses have set up shop in Hailey, a trend that the Hailey Chamber of Commerce would like to see continue. North and Co. was a mainstay of the retail community, offering a range of clothing, footwear and accessories for men and women in a historic building. It was the largest clothing retailer in the south valley for years, and offered numerous young residents their first chance at employment. Co-owner Jennifer Hazard Davis, who lives part-time in California, confirmed to the Idaho Mountain Express last week that the store would close for good in coming weeks. "FAREWELL FINE FRIENDS!! After 25 years of business in the valley, we are closing our doors. Stay tuned for a fantastic final sale. I have loved serving you and will miss my wonderful customers and friends." Heather Deckard, executive director of the Hailey Chamber of Commerce, said new businesses are also moving into Hailey. "Technically, it's a net gain," Deckard said. "There have been more businesses opening than closing in the last two months." Valley Paint and Floor Coverings moved in December from Bellevue to 108 N. Main St. between Taste of Thai restaurant and the Liberty Theatre. Kashino Design and Gallery celebrated a grand opening on Dec. 15 in a building formerly housing the Hailey chamber at 309 S. Main St. Artist Mark Kashino decided to put his graphics design business, art studio and gallery under one roof in the building, hoping to attract customers from Main Street. Shorty's Diner, across from Hailey City Hall at 126 S. Main St., will open to serve dinner starting this week for the first time in 10 years. "We've had people ask us to open for dinner. We're responding to customers' desires," said Shorty's owner, Jacob Greenberg. The opening of the Mule Shoe Tavern at 107 S. Main brightened up a block of mostly historic buildings on Main Street. The opening was followed by the recent closing of 310 Main restaurant a few blocks to the north. Deckard said changes taking place at the Hailey chamber this week are aimed at increasing marketing of the city for regional events. She said valley resident Ramona Duke will soon be hired to focus on membership and networking in the local business community, leaving Deckard to focus on regional marketing to draw events to the community. "This will be instead of having one person pulled in multiple directions," Deckard said. Mayor Rick Davis said the changes were the "brainchild" of Patrick Buchanan, president of the board of the Hailey chamber.